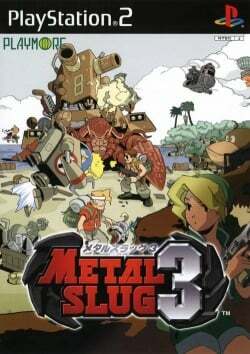 Game description: Not merely an arcade port, Metal Slug 3 for the PS2 sports brand-new features and original missions. Now you can choose from more than 10 new slug vehicles, including the Slug Copter and the Elephant Slug, and go head-to-head against submarines, large locusts, and giant bosses. Use handguns, power-up grenades, cannons, and more to battle evil forces. Fight alone or cooperatively with a friend in such locations as a deserted island in the South Seas, an underwater bioweapons factory, and outer space. This page was last edited on 22 June 2018, at 19:25.